You can't get more heart of the community than a tiny little secondhand bookshop with a sofa and a range of random events. Not that I knew about any of this when I turned up, boyfriend in tow, during a day of bookshop crawling. At the time we'd simply chosen to visit because Offside Books in north London sounded like an interesting place to explore. We walked through the door and realised 'explore' was possibly a bit of an optimistic word, because this bookshop really is rather snug, but what it lacks in size it more than makes up for in personality. At the time of our visit the bookseller was very enthusiastically chatting to another couple, discussing bookshop activities they'd like to make the most of and generally giving nosy me the impression this bookshop is the place to be if you want to know what's going on in your community. The limited space meant it was impossible not to listen in to their conversation, but I don't think that mattered – this was the place to arrive as a stranger and leave as a friend. Even if you weren't interested in the extra-bookular activities, a table for two looked appealing for chess players and a comfy sofa dominated the centre of the shop, demanding to be relaxed on with a book. I think hot drinks were available too, so had we not been in the middle of an adventure I'm sure we could have comfortably wiled away the afternoon here, making friends and soaking in the atmosphere. Instead we took to exploring the shelves, which covered two walls on opposite sides of the bookshop. the space was so limited I'd say a good 50 per cent of the stock could probably be reached from the sofa, but this simply added to the charm. A full fronted window also means the space didn't feel at all dark or cramped. 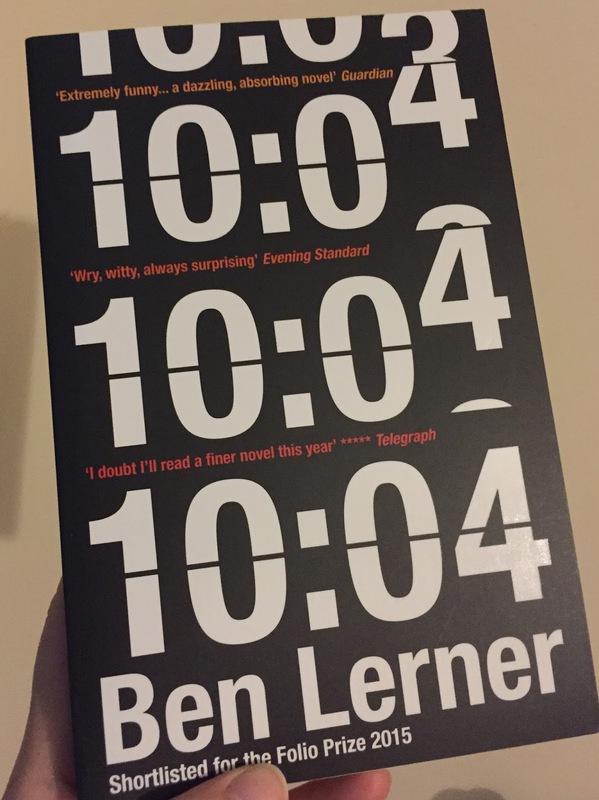 Books were obviously limited, but there was still a nice variety and I had no trouble choosing a purchase: 10:04 by Ben Lerner. The bookshop's popularity and our lack of time meant I didn't get the chance to make friends with the bookseller on this occasion, but from the experience of other visitors, and the atmosphere in general, I'd say the people of Kilburn are lucky to have such a friendly place to hang out in. My childhood reading went from Ladybird books to Sweet Valley High to whatever I could find on my Gran's bookshelves and so, sometime in my teenage years, when all my friends suddenly started quoting lines from Pratchett at each other I had no idea what they were talking about. Initially, it felt like they'd joined some kind of cult, conversing in quoted sentences that meant absolutely nothing to me, but after a while it became frustrating, so when I did get the chance to read one of his books I rejected it, having been put off by not being part of the gang. However despite this rejection I did grow to have a respect for the books and their author, and I was pleased by the number of people whose reading adventures had begun thanks to Terry Pratchett's writings. Not that this helped when I arrived at Discworld Emporium and realised how little I knew about his books and characters. Arriving at the bookshop, the front is both understated and striking, as a sign for Ankh-Morpork swings above the door, which has an amusing blue plaque to one side, but what's really impressive is the inside. To the left of the door is the main area of bookshop, which includes copies of every book Terry Pratchett contributed to as well as stationery, games, Discworld memorabilia and, obviously, a selection of jewellery. Then to the right is a slightly partitioned off area, where the staff were sat chatting while wrapping up parcels to be posted elsewhere. None of this truly enables you to visualise the room. It's dark wood, with the look of a gentleman's library and an atmosphere of warmth and welcome. An orangutan presides over the books, and all about there are details which I'm sure all Pratchett fans will appreciate, I certainly did. My ignorance of all things Pratchett meant I had no idea where to start with the books and so as the booksellers sounded so cheery I decided it would be best to own up and ask their advice. It felt a little wrong going to the counter and admitting I'd not read a single book by the author, but my ignorance wasn't held against me and the conversation felt a little like I was being welcomed into the fold. Anecdotes were shared, books discussed and a friendly dose of rudeness in the context of the characters was also dispensed as I was introduced to the appeal of the Pratchett world. Wyrd Sisters was the eventual recommendation (and having since devoured it I can finally see why the books are so popular), while my boyfriend, who has previously read a little Pratchett, opted for Mort. Upon opening our bag later we also discovered a selection of mint humbugs and our receipts – from the Thieves' Guild. Discworld Emporium may be a very focused specialist bookshop, but as a treat for fans and an inspirational destination to nurture young readers it must surely be considered a worthy destination. Only take care to choose the date of your visit wisely, like the whimsical nature of Pratchett's books the bookshop doesn't open to the usual hours. *No, I'm not sharing a photo of the scythe earrings, if you want to find out what they look like you can jolly well go to the bookshop yourself to find out! **Prior to this visit my knowledge stretched as far as Death, the play of Mort, Discworld, the tortoise and, obviously, the orangutan librarian. One bright, reasonably sunny day in May, a bookshop won an award. Not an official award with a trophy or a certificate (although there may have been an official certificate involved somewhere), but an award all the same. Because this bookshop blogger officially declared it to have the best Christmas bookshop window. Which obviously makes it true. Don't believe me? See here, it's all the evidence you need. The fact it was a finalist in a competition I wasn't judging and there weren't any other bookshops in the shortlist of three is completely irrelevant. Gulliver's Bookshop in Wimborne, Dorset, was the highest placed bookshop window in The VM Christmas Awards (and was beaten by Hamleys toy shop) so I reckon it's a winner. Everyone please give them a big round of applause. Having said that, now I've visited the bookshop I pretty much think the whole town of Wimbourne is a winner for having such a lovely destination at its heart. My first impression of Gulliver's Bookshop was one of friendliness and welcome. I enjoyed the buzz of customers chatting to the bookseller and no one batted an eyelid when my boyfriend made me pose for a photograph with a book about Scrabble* found on the discount table. This table was located conveniently close to the door, luring browsers in with the offer of cheap books I'd have happily paid full price for, but I can't imagine Gulliver's needs to go to much effort to encourage people in. The stock is varied and plenty, and combined with the friendly atmosphere there's a lot here to appeal. Non-fiction runs along one wall, and everything from a biography about setting up a space observatory to essays on the story of water caught my attention, with an equally diverse fiction offering opposite. It even – joy of joys – had a whole bookcase of science fiction, with titles by the likes of John Christopher and Brandon Sanderson (I bought The End of the World Running Club by Adrian J Walker). While the other end of the fiction offered a good selection of the classics. However towards the back is a bigger surprise, with a large mechanical Lego figure welcoming children to their area of the bookshop. Okay, so Lego doesn't make a reader, but I can't be the only one who thinks this is a great combination, I'd certainly have loved such a diverse children's area when I was younger (if I'm honest I still loved it today, I couldn't contain my excitement when the Lego man was actually switched on). Gulliver's Bookshop is family-owned, and I was lucky enough to find out more about the various generations' dedication to the trade when I got chatting to the booksellers. They're a welcoming, knowledgeable family who obviously care deeply about books and the community, it was a pleasure talking to them. Finally, Gulliver's also organises Wimborne Literary Festival, if you happen to be in the area in the middle of May. *I suggested he might need the book if he's ever to have a hope of beating me. He took the joke quite well, probably better than he will when he realises I'm mocking him now. Independent bookshops are the most special of bookshops for many reasons, but one of those reasons is their uniqueness. Other than an assortment of books, shelves and a bookseller or two, there's no telling how they might be interpreted or what other random treats you might find. That surprise is a wonderful part of the appeal of the bookshop visit, but sometimes it can also be good to know what you're walking into. Queens Park Books is one half of a pair of London bookshops, and as I'm already a fan of West End Lane Books I was reasonably optimistic about this destination as I dragged the other half along during a bookshop crawl. That said, I hadn't expected my first impression of the bookshop to be the sight of a giant cuddly panda climbing the tree outside the shop. * It was also a well concealed panda, leaving me wondering how many people actually notice it as they pass? Moving inside, Queens Park Books is exactly as smart, stylish and well-stocked as I'd anticipated. 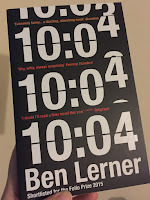 It's smaller than its sister, but that in no way diminishes the browsing experience, and with two chatty booksellers on hand to answer all my questions (first up, why's there a panda outside? Oh, and I see you have another panda above the counter?) I soon found myself at home. The smaller space (which is still generous in independent bookshop terms) means tables and book displays are slightly closer together, but the quality and range of books was as good as I'd anticipated and kept us both busy (when we weren't staring at pandas). This photograph also doesn't do justice to the way the bookshop is laid out, because even with all the choice and variety there's still a good-sized space at the back for a colourful (and equally well-stocked) children's section. There was a lot to appeal to my reading tastes, but my purchase was Jenny Colgan's Resistance is Futile. A love story set in sci fi land, I'd struggled to find this one on other bookshop shelves so knew I had to make the most of it here. This slightly off the wall choice is partially indicative of the rest of the stock. No, it's not all sci fi romance, but it is a good mix of lighthearted fun and intelligent heavy hitters, with a liberal sprinkling of unexpected titles some smaller bookshops may not have the shelf space to hold. As for the panda story. It's a randomly brilliant one, but if you want to hear it you'll have to go along to the bookshop and ask for yourself. * The sister bookshop has a local Penguin who's made himself at home, so who am I to question the recreational choices of other cuddly toys too?